The Fontan circulation is a surgically established treatment for complex congenital heart diseases in which one of the ventricles is functionally unable to pump blood, leaving the heart with a single working ventricle. While this surgery keeps patients alive, changes to the circulation yield significant complications, resulting in a reduction in life expectancy. In Fontan circulation, systemic and pulmonary circulations are coupled in series without a ventricle supporting the flow of blood to the lungs. Therefore, pulmonary blood flow and diastolic filling of the ventricle are reliant on passive flow of systemic venous blood through the pulmonary arteries. This has lead to the common hypothesis of pre-load inefficiency – which suggests that reduced pre-load limits the capacity of the congenital heart to increase its workload under exercise. As a result of pre-load inefficiency, Fontan patients also exhibit exercise inefficiency. While normal morphological hearts can produce up to a five-fold increase in cardiac output in response to exercise, Fontan patients typically only achieve 50-60% of predicted maximal exercise capacity, as their ability to improve cardiac output is impaired. As increased HR increases metabolic demand of the heart (for the same cardiac output), this response mechanism to increased demand in the body suggests potentially significant inefficiency in Fontan patients. Chronotropic modulation presents a potential improvement to work efficiency in the Fontan heart by limiting HR increase. This effect is currently being examined as part of an ongoing clinical study at KCL. Using MRI under rest and exercise conditions, Fontan patients will be scanned and noninvasive pressure estimates obtained. Exercise MRI will be acquired in patients under normal conditions and after administration of a negative chronotrope. 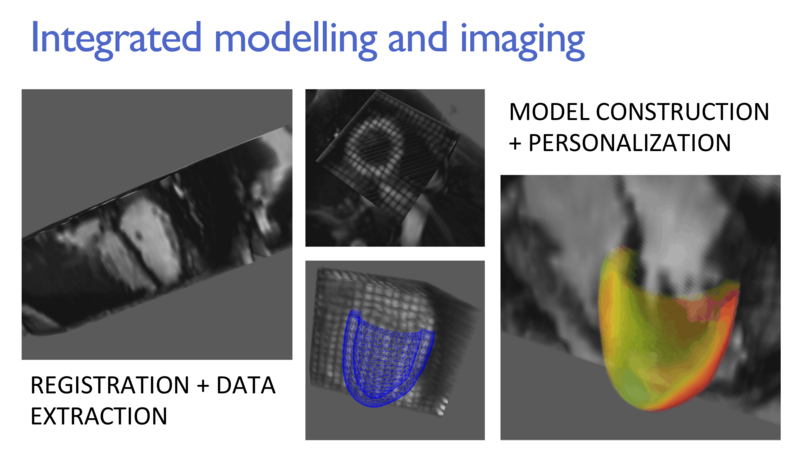 Acquired data will then be used to generate computational models of the heart, assimilating known anatomy and function. These models will then be used to assess work efficiency, gauging whether chronotropic modulation leads to an improvement in work efficiency under exercise.